Today we woke up very early like 3 am to catch our flight to Palawan. Luckily we also went to bed very early last night so it really didn’t effect us. Our flight left Manila at 630 am. When we got to the airport it was so crowded! The line wasn’t moving at all. I was sure we were going to miss our flight. But all of the sudden the line started moving pretty fast and of course our flight was a little delayed. I’ve never had a flight going or coming from the Philippine Islands be on time. For this trip we took Philippine Airlines. We usually take Cebu Airlines. I don’t remember much of Cebu…but I think they might be a little better than Philippine Airlines. For one, the seats are super small on Philippine Airlines. There was hardly any room between the seats! 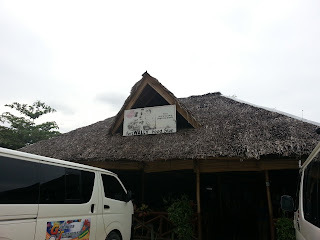 Once we landed in Puerto Princesa, Palawan we looked for our shuttle with Day Tripper to take us to Stunning Vistas Beach Resort. We couldn’t find them anywhere! I was concerned because our flight was a little late so maybe we had missed them. So we went to the travel office and they contacted Stunnning Vistas and they said our van had broken down so they had arranged for someone else to pick us up. Fort Wally was the company that picked us up. When we got in the van we were the only ones and I thought that was how it was going to be….I was wrong. They took us to their office and told us that the next shuttle was around 9. It was about 8 so that was okay. But then it turned into 10 then 11. They kept telling us they wanted to find more people. It was very annoying. Around 1030 another couple came up. Later we would learn their names, Yan and Alex, a couple from Germany. They were also staying at Stunning Vistas. So then it was around 1120 and finally they started loading up the van. We had acquired a filipino man and woman also. So it looked good, looked like it would be six of us. They loaded our luggage in the back of the van and we were all sitting pretty comfortably. There was still one row that was empty. Then another couple came up and joined the van. So now me, Don, Yan, Alex, 2 filipinos, a French woman and a man from Denmark. We all got in the van and were still sitting pretty comfortably and we had started on our 5 hour journey to El Nido. that. So the guy that had started unloading all the luggage so he could put it on the roof started putting it back in the van. One of the drivers told the girls they wouldn’t be able to make it to El Nido today. So then somehow it worked out we acquired 3 of these new passengers and the rest (like a group of 7) got in the other van. So up on the roof our luggage went! It did not seem safe. But off we went. The 3 new passengers were from Uruguay They were on a college graduation trip. They were all accountants. The guy told us it was tradition in his school for the graduates to take a trip. He said some people go for about 3-4 months but he is probably doing 7 months. 7 months vacation! I couldn’t believe it! They had already been traveling for some time! We learned Yan and Alex from Germany had booked with Stunning Vistas about a week ago; they had about 3-4 weeks left of travel and hadn’t really planned it out they were just booking as they went. Denmark and France seemed very spontaneous since they had just up and decided they would come to El Nido. They had been in Manila the past few days and they were headed to El Nido with us and they hadn’t booked a room yet. I couldn’t believe it! These people were just living and not by a schedule. I feel like in America we only have so long for vacation and everything is pretty much planned out. I want a 7 month vacation! So we thought we were pretty much on our way when the van pulled over again. The driver got and talked to someone at a store. Then we he tried to turn around so he backed up and we heard a loud noise. The back tire had gotten stuck in a rut alongside the road. We had to get out and help push the van out! What kind of road trip was this going to be?! What else could happen!? The driver drove like a maniac. The road was so curvy and he would take it top speed. He would pass other cars with no regard if an oncoming car was in the way. It was scary. And my stomach was not handling it either. I started feeling carsick. Sometimes on the ride I felt we might not make it out alive. I had really never experienced such a crazy driver. About 2 hours into the ride we pulled over at a restaurant. It was kind of like a buffet. We got some adobo and rice. I took some Dramamine for the carsickness. Here’s a picture of the pitstop. The rest of the ride was really no better. I would try to look out the window but I felt like my head was spinning. The driver was always tailgating someone or passing someone with another car coming right at us. Finally around 6 we made it to El Nido. We should have been there around 2. The driver went into town though and didn’t drop us off at our hotel. When we got there we told him he was supposed to take us to Stunning Vistas. Yan and Alex also needed to be dropped off there. So eventually he did. When we arrived at Stunning Vistas all I wanted to do was go in the room and relax. They made us welcoming drinks and we sat by the beach for a few minutes. We made it in time just as it was getting dark. 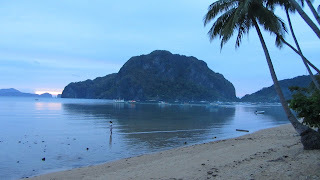 Here’s our first glimpse of El Nido, Palawan. Then we went to get our room key. We had booked a standard room but were told due to construction they had upgraded us to a deluxe room for tonight and we would be moved to the standard the next day. The deluxe room was okay. It looked kind of old. The TV didn’t work,but the bathroom was better than what we had at the airport hotel. The room also had a fridge. I am a little scared to see what a downgrade will look like tomorrow! After we got settled in a bit we went to get some food at the hotel’s restaurant. Yan and Alex were there and they asked if we wanted to eat together. They were very nice and we had some good conversation. Good thing because the food took well over an hour! It was amazingly slow. So we vowed not to eat at our hotel for dinner again. Philippines Trip-We’re Sending Sewers To Japan!! !